Although Fall has officially arrived on the calendar, the weather hasn't followed suit. So I figured I still had time to tackle another item on my short summer bucket list- making Popsicles with the boys! 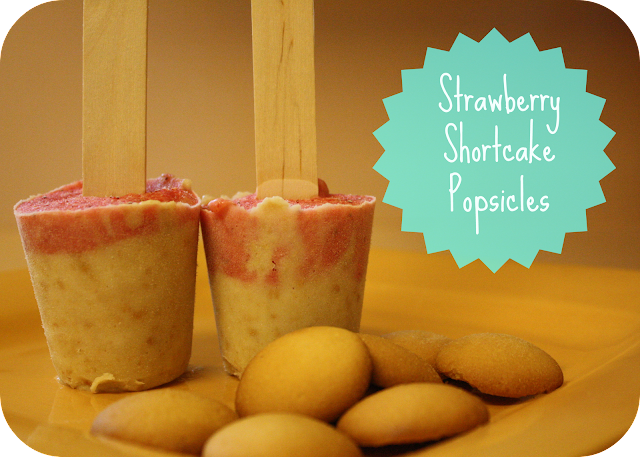 We went with these Strawberry Shortcake Popsicles since we had some strawberries we needed to use. We substituted vanilla yogurt for the plain yogurt, and they turned out delicious! As Silas put the strawberries into the food processor, Liam took them out to eat them. Silas loves to help in the kitchen. I allowed him to use a butter knife to help me cut up the strawberries. Putting the vanilla wafers into the food processor. All of our ingredients ready to go! Silas licked the honey bowl clean. Silas went a little heavy on the yogurt mixture the first time around so our Popsicles were actually two layers instead of three! Having fun filling up the Dixie cups. Several hours later, we enjoyed our Popsicles. Silas was slow and steady with his. Liam, on the other hand, devoured his in record time! No surprise there! Have you had any kitchen adventures lately?